Gone are the days when foreign companies operating from China predominated in its export market. Now, home-bred Chinese firms are taking the upper hand. Gone are the days, too, when China was reliant on Western markets for its exported products. Now, Chinese-built markets in emerging markets of the developing world are taking the lead in China's export trade. So much so, that competition from this superpower-in-the-making will look very different in the coming decade. Ten years from now, Chinese brands will be commonplace in the global commercial landscape, particularly in the world’s increasingly important emerging markets where business opportunities for growth will be the most prevalent. Already, non-OECD (Organisation for Economic Cooperation and Development) countries account for 36% of the world's imports (2010 figures) — a share that has risen from 25% in 2001. Capital goods, rather than consumer goods, are leading the way. In the past, competition from China in low-end exports, such as toys and games, helped to produce a disinflationary effect on importing countries. Now that China’s higher-end exports are seeing success in emerging markets, Chinese companies are able to produce such goods relatively cheaply as well. In turn, competitive prices from China force rival global manufacturers to look constantly for ways to add value and stay ahead of the curve. Some economic analysts say that, despite rapid progress on the technology front, Chinese companies have 'gone to ground' before catching up with the West: under the veneer of a seemingly unstoppable Chinese manufacturing machine, it is suggested, lies a frail foundation. However, the influential Economist Intelligence Unit forecasts that, as Chinese wages rise and technology progresses, Chinese exporters will move up the value chain and increasingly compete in the core product markets of developed countries. Chinese manufacturers of heavy equipment, notably in the construction machinery sector, are likely to take the lead. China is also expected to overtake Germany and Japan in construction machinery exports by the end of 2011 — to become the world’s second-largest exporter of such goods, after the US. The Economist Intelligence Unit admits Chinese penetration of OECD markets in high-end manufacturing is likely to be limited, but China will see rapid increases in market share in non-OECD markets where Western companies have in recent years lost significant export market share. After a painful economic downturn, but nowhere near as painful as in the West, China's export growth has already recovered to levels seen just before the downturn started to bite. Since 2001, China has steadily increased its share of global manufactured exports, by around 1 percentage point per year. In 2010, the country’s share of global manufactured exports reached 13.7%, up from 12.1% in 2009. This trend in growth is likely to persist in the coming decade. Some economic analysts say that China will reach a point where mounting labour costs trigger declining shares in low-end exports, off-setting gains in the mid- and high-end value segments. To date, however, China's export market share in low-end goods is still increasing. The Export Similarity Index (ESI) — a measure of the extent to which two countries export the same products — shows how far China's exports are beginning to overlap those of its wealthier trading partners. Theory behind the ESI suggests advanced countries, with more capital and superior technology, are expected to export more-sophisticated goods such as electronic machinery. Less-developed countries, with less capital and inferior technology, are expected to export less-sophisticated goods, such as apparel. Until now, China was classed in the 'less-developed' category. But ESI rankings show times are changing. Although levels are still low, indicating that China is still predominantly a labour-intensive, low-end export power, excelling in production of commodities such as clothing, textiles, footwear and toys, over the last decade trade between China and Japan, the European Union and the US clearly shows that China is moving upstream in the value added stakes. China’s growing global empowerment through export growth hasn’t just happened by chance. While Western powers have been focussing on domestic economic upheaval, the Chinese government has promoted education reform, stimulating far more organic technological progress. According to the Economist Intelligence Unit, China is producing more engineering graduates each year than any other country in the world — even though, currently, nearly 80% of its population does not finish secondary school. In green industries, where the Chinese government aspires to be a global leader, massive subsidies have kick-started production of everything from wind turbines to light-emitting diodes (LEDs), even though some installations currently sit idle because of lack of technical expertise. By adopting numerical targets for patent grants, for instance, the Chinese government is forcing the pace of innovation. China has seen a tenfold increase in patent grants over the last decade, even if comparability with US patents in terms of content and quality is still low. While Western counterparts suffer under ingrained economic pressures, Chinese companies are demonstrating a remarkable ability to assimilate technology, adapt products and processes, and to do so quickly and cheaply. So to what extent should developed economies be worried about China’s rising manufacturing sophistication? Past experience suggests that when China ramps up in a sector, backed by economies of scale and substantial investment, the global impact can be considerable. This was the case in the steelmaking industry in the mid-2000s. The Economist Intelligence Unit has plotted the past developments over the past three years in sectors in OECD member countries currently experiencing Chinese export competition: a total of 217 commodity export markets with a global export value of at least USD 10 billon. 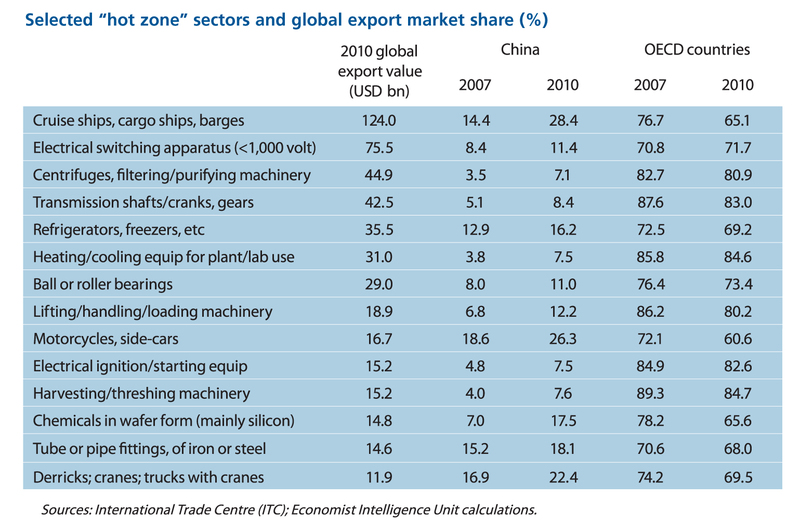 The Unit categorises 'hot zone' sectors where OECD economies held a dominant market share, and into which Chinese exporters have made significant inroads over the past three years. A total of 37 sectors are in the 'hot zone', representing a global export market value of USD 927 billion. OECD countries' share of these export markets has fallen from 79% in 2007 to 74.7% in 2010. Meanwhile, China’s share has increased, from 8.5% to 14%. So the effect is limited, but growing. Most of the sectors involve capital equipment and related parts, reflecting improvements in precision levels of metal-cutting/shaping facilities and in metallurgical processes. Many components which were previously hard to produce, in particular those that required a certain level of strength, durability and precision, are now being mass produced by start-ups that have successfully reverse-engineered imported products. The sensitive nature of these 'hot zone' sectors is also reflected in the use of government trade defence measures. Developed countries in particular have begun to diversify the range of measures used to shield their domestic industries. The EU and US in particular have stepped up their use of anti-subsidy. For all the acrimony over the 'hot zone' sectors (see table above), these segments still represent a relatively small portion of world trade. China has yet to make any notable impact on the USD 553 billion car export market, the USD 310 billion packaged pharmaceuticals market, or the USD 85 ­­­­billon aircraft market. So, although Western governments may not as yet be experiencing significant competition in their home markets, they are facing a formidable challenge in overseas markets that prospectively offer one of the world's biggest prospects for growth. In 2008, for example, 71.5% of all machinery imports in the BRIC countries (exclu­­­ding China) and South Africa came from OECD countries. This share fell to 63% by 2010. China’s share increased from 17.5% to 21.8% over the same period. UHY has a strong presence in China through its member firm, Zhong Hua CPAs, Shanghai. UHY member firms are known worldwide for their core accountancy services. But member firms are expanding their service provisions into allied services specifically to meet the varying needs of their clients. As a result, clients have developed a longstanding trust of UHY and retained those services over many years, often over successive generations of family businesses.